Le Polynesien is a World War I wreck dive in Malta. SS Polynesien was a 19th century French ocean liner that was sunk by a torpedo in August 1918 about 3 km east of Marsaskala. She is 152 m long and lying on a 45 degree angle on her port side at a depth of 45 m (upmost structures) to 65 m (seabed). The bow section deck structures are in a good shape. Front deck cannon and anchor are clearly visible, and the cargo bay contains motorbike tires and pipes. The mid section accommodates the engine room. This area of the wreck is badly damaged by the torpedo impact. The stern section has some structural damage, but is mostly intact. The stern deck cannon and propeller are pretty much in a perfect condition. Under the deck are passenger areas where light fixtures, bed frames and bathtubs can be seen. 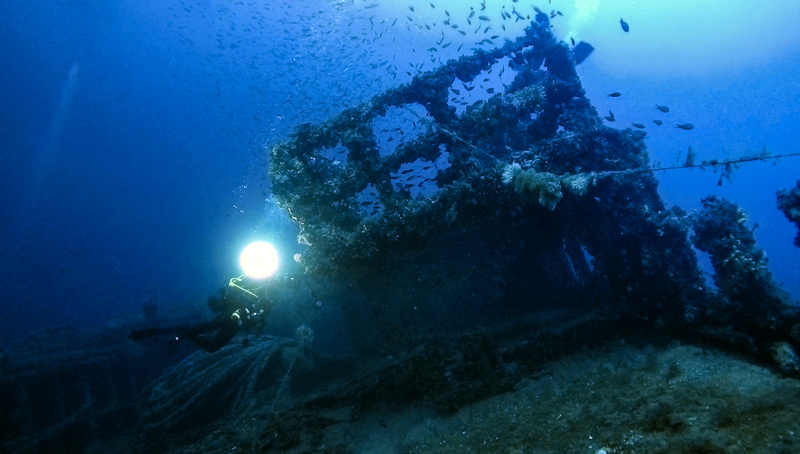 Le Polynesien wreck is a deep boat dive and suitable only for technical divers or very experienced divers as it is exposed to strong currents. SS Polynesien was built in 1890 by Messageries Maritimes in La Ciotat in France. She was a Risbec class ocean liner, one of four sister ships, measuring 152.5 m in length with a beam of 15 m. Polynesien was a 3-masted barque made of steel, with a steam engine, double funnel, and a four-bladed propeller. She was built for hot climes, having limited superstructure with canvas shades covering the decks for protection from the sun. SS Polynesien operated first on France–Australia route through Suez Canal, and later Far East to French colony destinations, and then again towards Australia and New Caledonia, before being dispatched back to Europe. At the beginning of World War I she was requisitioned by the French authorities and armed as a troop transport. Polynesien’s final voyage, only three months before the end of the war, was from Bizerte in Tunisia to Salonika (Thessaloniki) Greece, transporting Serbian troops. On 10th August 1918 the French steamer was torpedoed by German submarine SM UC-22, only few kilometres off Malta. She was hit on the port side near the engine room and sank within half an hour with the loss of almost twenty lives. The video below takes you from the bow through the collapsed mid section (1:00) to the stern deck cannon (1:30) and then back to bow (3:00) again. Bow cargo hold contains some bike tires (4:00) and pipes (4:30). The passenger area (5:00) with bathtub (5:30) is located at the stern above the cargo hold (6:00).